Northwest wants to give campus technology users an on-campus experience that accommodates academic, professional and network entertainment activities such as the use of gaming consoles and popular activities that require certain network ports to be open. Some restrictions apply and registration of gaming consoles like Xbox One are required. Gaming console systems such as Xbox and PlayStation are not allowed to connect to the Northwest wireless network. However, such devices are currently allowed on the wired Northwest network. You will need to register your Gaming Console with Northwest Technology before you can successfully connect to the Northwest wired network. To register your gaming console system, you will need to provide your gaming console system's wired MAC Address information to successfully register your game console. Information Technology, whenever reasonably possible, works with students, faculty and staff who need a specific network port open for computing purposes. 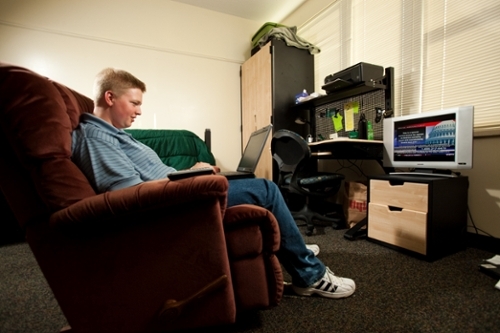 Like Gaming Systems, personal, non-campus-issued, network entertainment (ET) devices such as Smart TVs, Apple TV, Google TV, Roku, Sony Blue-Ray DVD player and TiVo are only allowed on the campus wired network. Unlike Gaming Systems, you do not need to register your ET device at this time. Northwest does not support or maintain personal, non-campus issued ET devices and does not guarantee that your personal ET device will successfully work on the campus network. ET devices will typically not work successfully on the wireless network. It is a violation of Northwest technology policy to have ET devices connected to the wireless network even if they aren't working properly.